Believe it or not, the biggest (and most significant) challenge of writing a course paper, thesis or dissertation is not getting the tables, figures, abstract and appendix in correct formats and in the right places, with the spacing and page headings just right. Professional formats and conventions make your work look professional and in control, but they don’t necessary mean that it is professional and in control. I have discovered that whereas it is usually easy to distinguish well-presented good ideas from well-presented bad ideas, it is often impossible to distinguish poorly presented good ideas from poorly presented bad ideas. . . . If an idea is presented in a sloppy, disorganized fashion, how is one to know whether this fashion of presentation reflects the quality of the idea or merely the quality of its presentation. So, the quality of presentation can be as enhancing—or as damaging—as the quality of the work itself. Unfortunately, there is no formula for making your presentation accurate, coherent, and accessible. A mindset that has become popular with professional writers and writing teachers during recent years might be helpful to you in conceptualizing and dealing with writing tasks. It’s actually a classification: writing is a craft. A versatile writer and writing theorist named Donald Graves (1985) explained it this way, “A craft is a process of shaping material toward an end” (p. 6). View yourself as a craftsperson with a large mass of facts, literature, precedent, and study data. You are shaping that material to present it to a particular audience for a significant purpose. If you approach your task with this sort of orientation, you may find that some of those shaping and perfecting processes seem to make more sense. Why does a sculptor sketch and model before taking on a block of marble? In order to fulfill the potential of the marble and the artist, strokes must be purposeful and accurate. Haphazard slicing will not produce beauty and grace. It won’t produce a coherent thesis or dissertation either. Careful planning is necessary in order to maximize the potential of your materials and your talents. Don’t just hack through your data. Plan purposefully how you will form it into an effective product. Yes, I know teachers have been preaching to you about outlines for years. There must be a reason for this, since outlining is a topic that is not any more fun to teach than to listen to. Outlining is hard, and it is usually time consuming. But ultimately its value in time efficiency and quality assurance is well worth what you put into it. An outline really is a way of exploring patterns and relationships. Yes, information has shape—logic of form and proportion, just as visual art, music, and poetry do. And people respond, consciously or subconsciously, to shape and rhythm in the flow of information, just as they do in the arts. If you are doing an article or a course paper, find your shape by looking at your purpose and the information you have to develop it. If you’re treating a problem and solution with about equal weight, then you have a natural two-part structure. If you’re looking at two possible solutions to your problem, then you have a natural three-part structure. If you’re exploring components, the shape will be determined by the number you will treat and the relative weight you plan to give them. If you are approaching something historically, then you may section off by historical periods, or possibly by philosophical positions, contextual circumstances, influences or schools. If you are discussing an experiment, the classic five-part experiment presentation will be your overall pattern and will form the main sections of your outline (I, II, III, etc.). For a thesis or dissertation, the overall shape provided by the chapters may be determined for you. If you have done an experiment, the shape of some of your sections will be predetermined as well. Be careful in setting up the structure of your dissertation according to the basic pattern and the headings given you by your chair. Choose content and shape for the introduction. Are you going from broad importance gradually toward specific applications supported by a progression of studies? Are you going to look at reasons for importance, followed by a historical overview of developing interest and increasing research? Are you going to begin with specific applications, broaden into theory, and then analyze the applications in terms of the theory? Example 1. When you are putting together a review of literature, decide on a general pattern. Perhaps your particular project brings together what is known about four different aspects of your topic. These four aspects then become your pattern for the review of literature as well as for the larger text. Be sure the four are sorted according to a principle of division that can be consistently applied so that they do not overlap (and thus lead to drifting and repetition). Also be sure that you do not include an aspect that doesn’t really apply. The following is oversimplified to make the point. Example 2. When putting together a section of findings, discussion, or conclusions, list out the main ideas and group under each the information you need to explain, demonstrate, and support your reasoning. If some of the conclusions extend or build on others, arrange them in the sequence that is necessary for them to be clearly understood. Eliminate information that is not necessary so that it won’t distract from your reasoning patterns. Try to end on your strongest and best supported area. If you have an instinct to put your best material in the early sections, gradually diminish, and end on a weak or poorly developed area, you will have an awkward top-heavy structure. To see if this is happening, list the number of pages in each section headed at level 1. If your numbers are something like 10, 14, 12, 12, 7, 4, and 2, then you have a problem. You need to build up those short sections, reposition them, or find a way of combining them. No, this isn’t a senseless torture invented by English teachers. Expressing each section and subsection as a subject/predicate sentence forces you to bring the information together as a distinct concept, not a vague designation of territory. When you force yourself to express things in terms of conclusions and relationships, you think in these terms, and you can test out their logic and support structures. The more complete and specific form of expression helps your professors and/or your graduate committee to understand more accurately what you are learning and how you are putting the work together. It’s difficult for faculty to advise and support you if they know only basic subjects in each section but not the ideas and conclusions you are forming from them. You know what information fits in with your purpose and pattern and what doesn’t. Thus, you know what to put in and what to put away. You can deal with your information in sections, not all at once—it’s less overwhelming. You’re not constantly grasping for relevance and relationships because you’ve already worked them out. By looking backwards and forwards, you’re able to see relationships clearly. 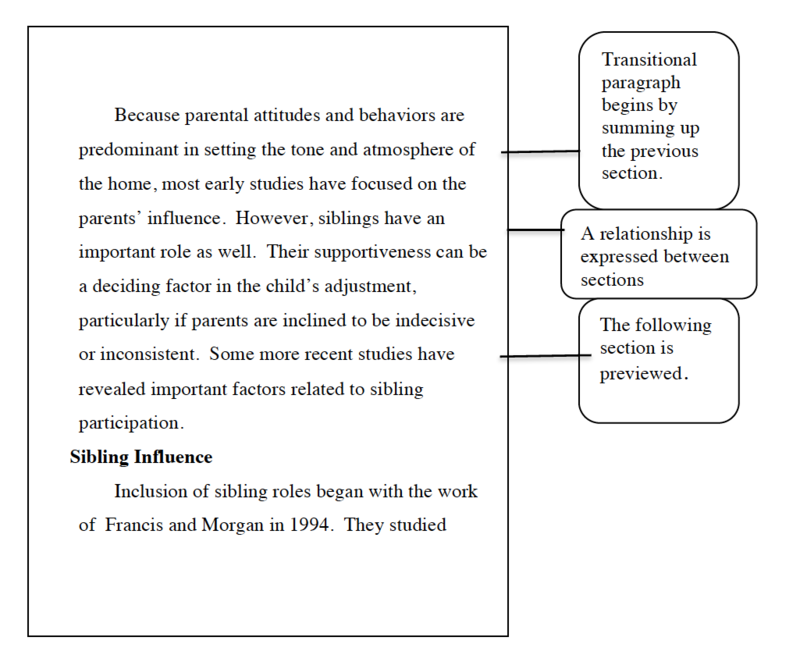 This helps you in expressing those relationships as you draft—both within the paragraphs and in your transitions. If there are places where your information is skimpy, you can gather what is needed before you get into the momentum of the drafting process. You know where to put your headings and subheadings, and you have the key words you will need in composing them. Contrary to popular opinion, headings and subheadings are not merely a formality or an afterthought in your writing. They can be among your strongest tools for controlling your own work and for making it accessible to others. Many people construct headings and subheadings mechanically and somewhat thoughtlessly because they do not understand what headings and subheadings should do. If you are very skilled (and lucky), then headings/subheadings that are placed and constructed in random fashion may still be of some use to your readers--but only if you do them unusually well. Use of headings/subheadings can be a powerful tool if recognized and used properly. 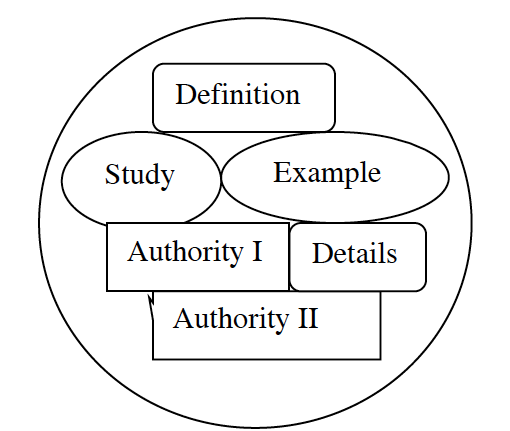 The Publication Manual of the American Psychological Association (2010) states that headings and subheadings should “establish the hierarchy of the sections via format or appearance.” They can do this because “all topics of equal importance have the same level of heading throughout a manuscript" (p. 62). You made the decisions in these areas as you prepared your outline. Thus, the outline becomes the guide to heading/subheading construction. Heading placement reflects the sequence and development of your ideas. Let your outline guide you in placing headings and subheadings. Following is a very general and flexible guide. 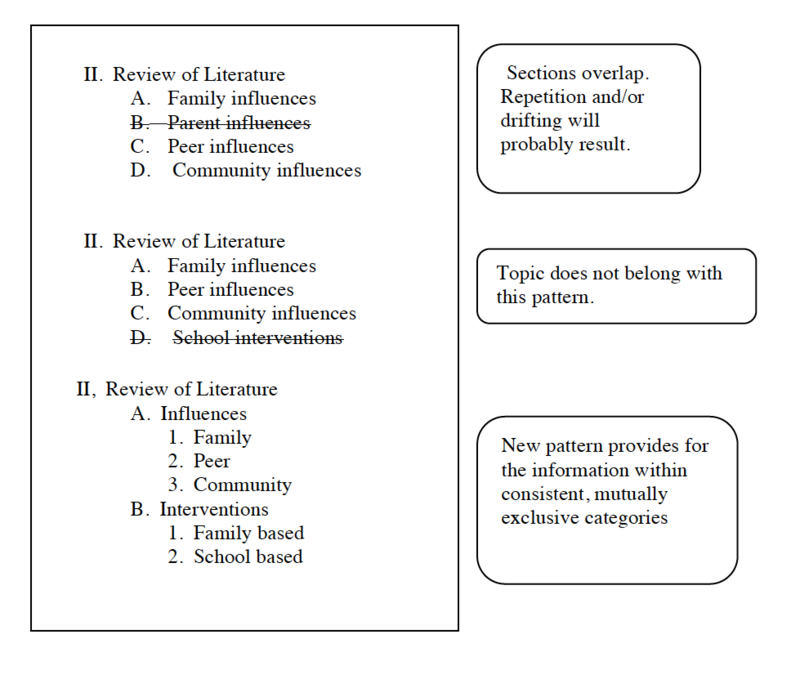 Overall pattern of chapter, article, paper etc. Each new level of subheadings represents a breaking down of the unit of information. You can’t break anything down (including a pencil) and come out with just one piece. You can have two, three, seven, or even fifty, but you don’t break to one. Thus, each time you break to a new level of subheadings, be sure that you have at least two. If you only have one unit to deal with, don’t break down. You do not have to have the same number of levels for every section. APA format uses five levels of headings. The number of levels you use will depend on the complexity and the length of your thesis/dissertation chapter, article, book chapter, document, etc. Layers of headings and subheadings are a guide to the way you layer meaning. 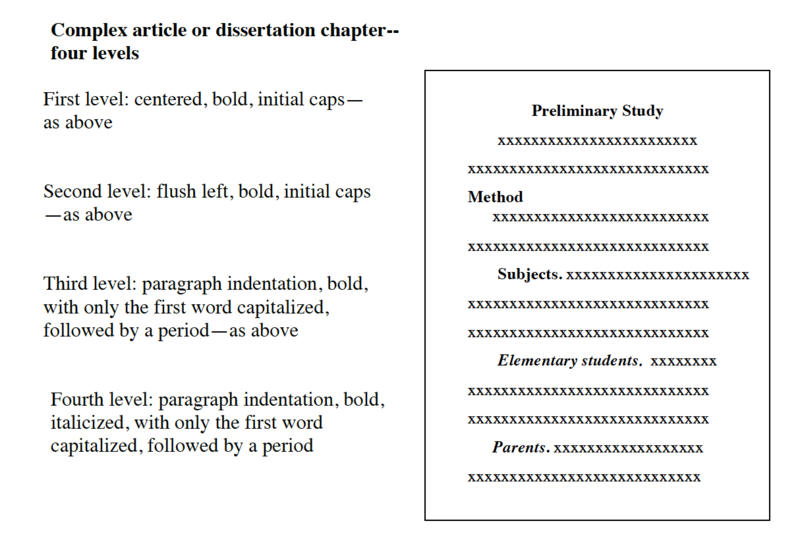 Chapter headings for a dissertation or a thesis begin at the top of a new page. Headings begin at the first level. 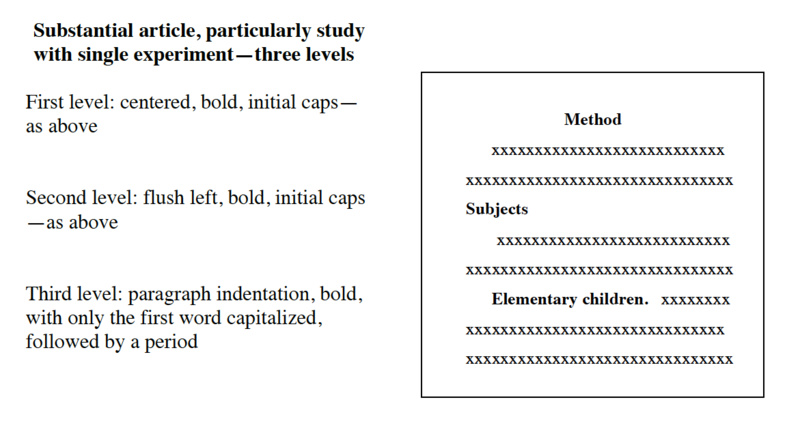 If a chapter designation (e.g., Chapter 3) is included along with the name of the chapter (e.g., Methods), then use the same level and placement of heading for both. Some writers like to use brief transitional paragraphs between sections. This establishes a smooth relationship between sections, reminds the reader of pattern of development, and reviews what went on in the previous section—for those who have become a little drowsy. Though a transitional paragraph is not a personal statement, the author reveals his or her own thinking regarding the relationships—an important aspect for students who want to reveal the depth of their own synthesis of ideas. 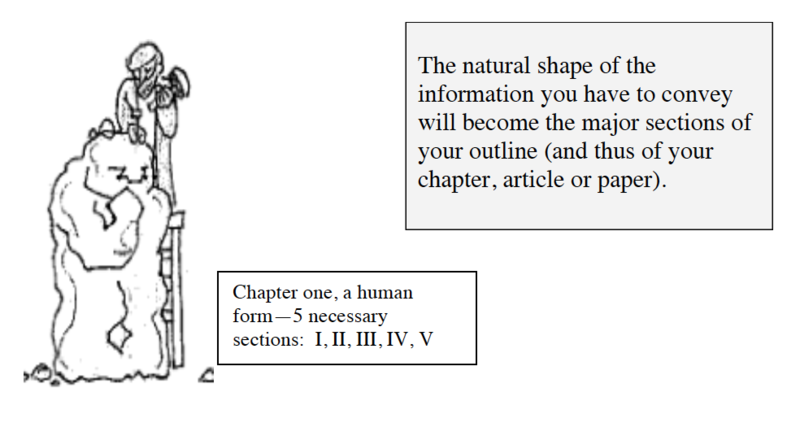 Within sections and paragraphs, additional transitions are needed to keep things orderly and to make the purpose and relationships behind the sequences clear. They are not as large, but they reflect ways the writer sees patterns and interprets relationships. Within paragraphs small, simple signals help to signal relationships and make things fit logically together. There is no formula for transition. Most of us use too little transition because we assume too much concerning our reader’s knowledge of the topic and ability to make connections. What feels like too much to the writer is generally what is required for the reader. An English professor once explained to a graduate student that if she felt like she was putting signs on the doors of the rooms in her house, she was probably using transition about the way she should (Glade Hunsaker, personal communication to graduate student, 2000). The paragraph is the basic unit of meaning that you use in research and other academic writing—and in most other types of writing, for that matter. You may not think very much about paragraphs when you are writing a letter, a journal, or a personal essay—they just seem to flow naturally. But paragraphing techniques are more important and need to be more deliberate when you are writing an academic paper, an article, a thesis or a dissertation because information is more complex and easier to misunderstand. 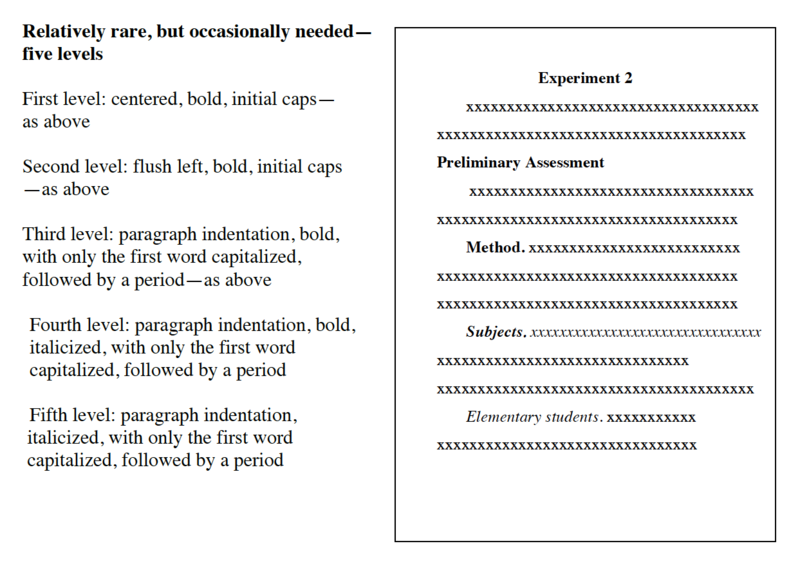 Following are some questions that are often asked—consciously or subconsciously—about paragraphing. Question 1: How Long Should a Paragraph Be? The Publication Manual of the American Psychological Association (2010) states that paragraphs should not be shorter than two sentences or longer than a full page. In general practice writers who know what they are doing can make very effective use of a one-sentence paragraph, and many lawyers, novelists and social scientists can produce paragraphs longer than a page that they think are coherent and accessible. However, when in APA territory, you need to follow APA instructions. The most important thing to remember about paragraphing is that a paragraph is a purposeful unit. As different paragraphs will have different purposes, they will have different lengths. A paragraph is the right length when it has fulfilled its purpose. Question 2: How Do I Make the Purpose Clear and Easy to Understand - Both to Myself and to My Reader? 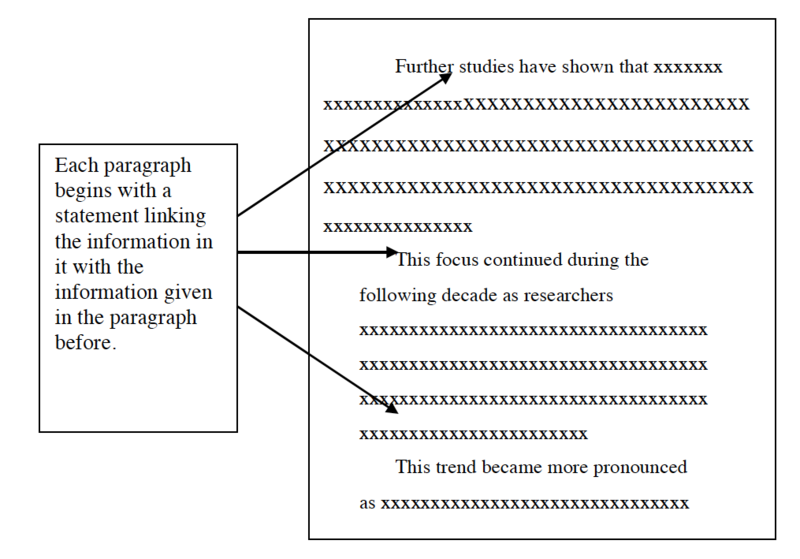 Paragraphs may have different functions or purposes. As noted in the section on transition, sometimes the purpose of a paragraph will be transition. Such a paragraph may be only two or three sentences. 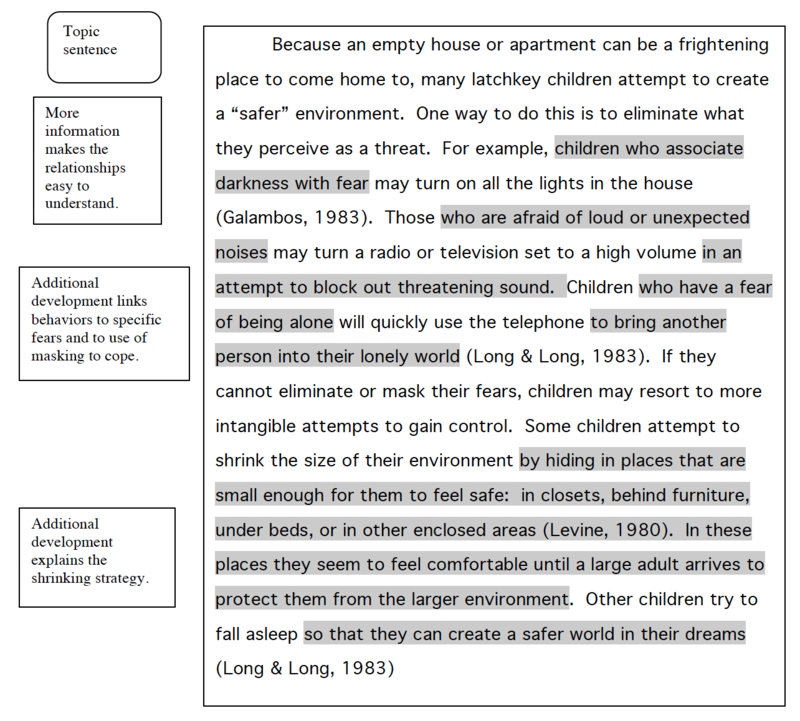 A similarly short paragraph may be used to isolate a particular point for emphasis. Some people will isolate the thesis or purpose statement, along with necessary explanations and definitions, resulting in a very short paragraph that calls special attention by its appearance as well as by its lack of developmental detail. 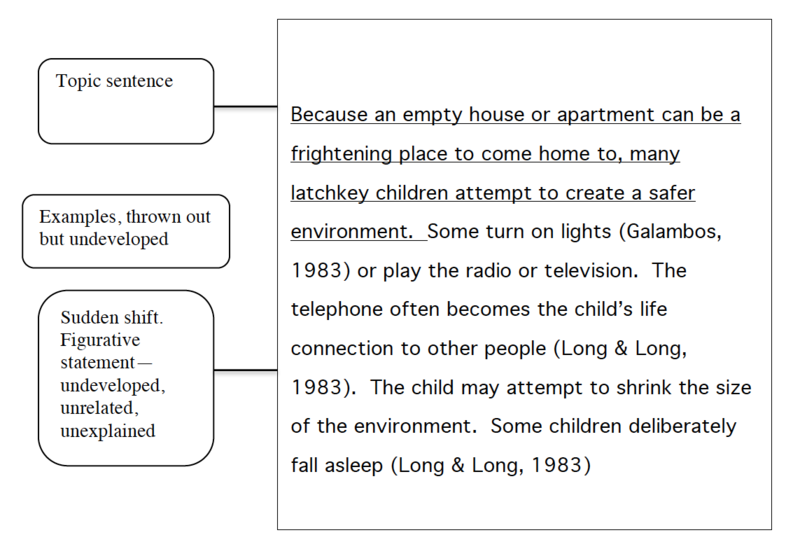 A developmental paragraph will have a controlling idea along with its necessary development and support. Most paragraphs are developmental. They take a particular portion of ideas/information and develop it to the extent required to be clear and convincing (long enough to cover the subject) but avoid adding so much bulk that it’s overburdened (short enough to still be interesting). In a narrative or descriptive paragraph, the details generally come together naturally without the writer consciously composing a topic sentence and comparing the selection of details against it. In academic writing, however, information is complex and often technical. Paragraphs that are not composed with a controlling sentence often wander aimlessly around both the writer’s and the readers’ minds. 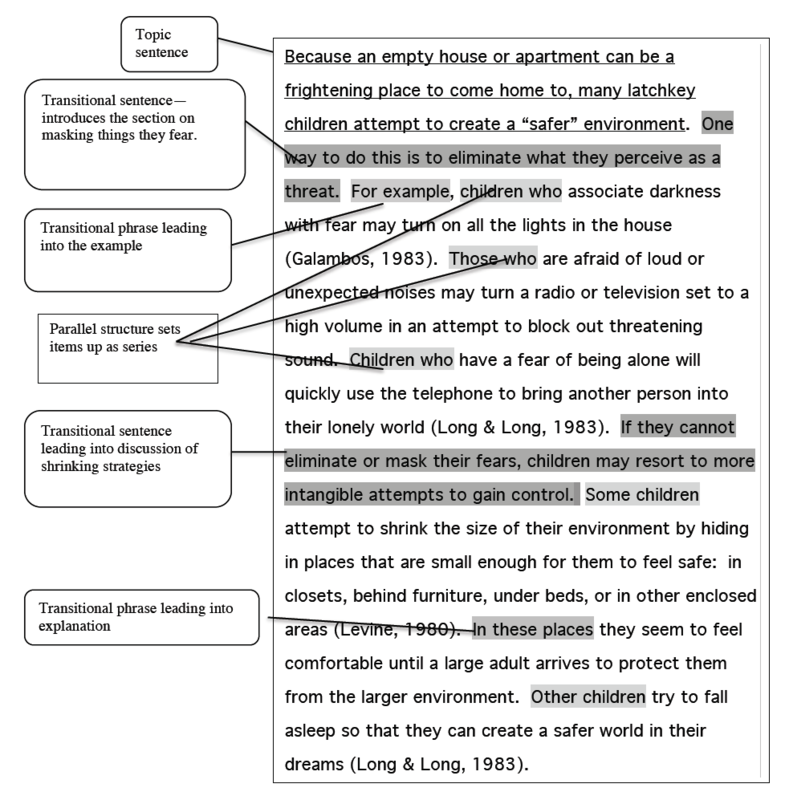 The topic sentence is a direct statement bringing information in the paragraph together as a purposeful whole. It can be placed anywhere in the paragraph, but the most common area is within the first three sentences so that it gives maximum control to both the writer and the reader. 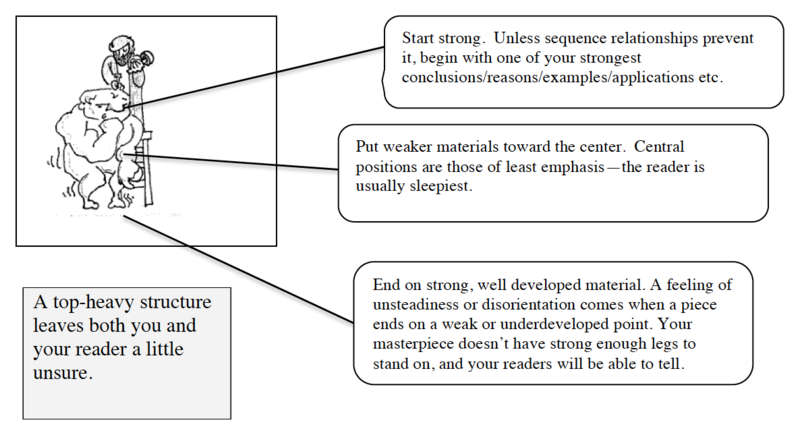 A writer who places the defining statement early is staring at it while composing the paragraph—this “visual aid” makes it harder to stray off the topic. A reader who sees the topic sentence early understands from the beginning why the information has been selected and how it comes together to make its point. Question 3: Are Paragraph Divisions Predestined? Am I Discovering or Crafting? Crafting—definitely crafting! In a good percentage of cases, there are different ways that information can be grouped as units. With practice you will learn to spot options as you draft. Perhaps you have three studies that all support the same basic conclusion. You will have three or four sentences discussing each. 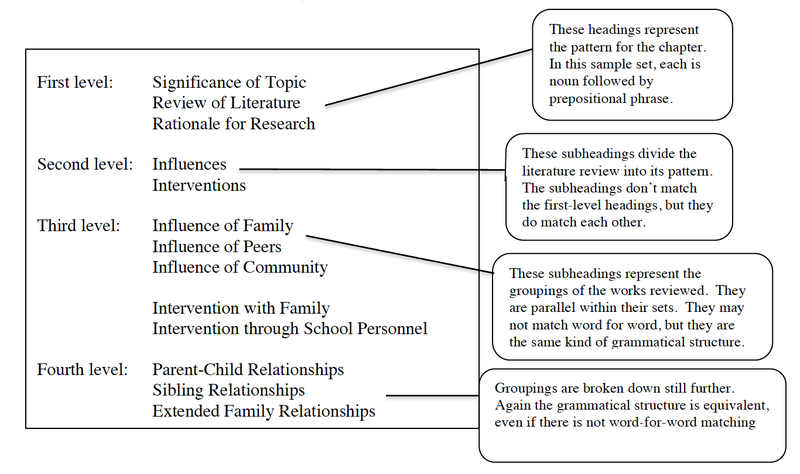 Do you combine all three as one paragraph since they all support the same point, or do you use separate paragraphs since the studies were completed at different times in widely separate places with different research designs? Suppose you are comparing two strategies for dealing with a problem. You will have five or six sentences for each. Do you deal with both strategies in the same paragraph since you want to show the superiority of one strategy over the other, or do you put them in separate paragraphs since they are really separate strategies? You want to use a fairly detailed case study to illustrate a significant point. Do you put the whole case study in one paragraph since it is just one case, or do you separate it into parts? Consider the purpose of the paragraph. Short paragraphs are more emphatic. Just as isolating one face and a few details makes the face stand out more, isolating one study, one side of a comparison, one reason, one cause, etc. makes it stand out with more impact. Long paragraphs emphasize interrelationships. By grouping things within a paragraph, you cause the reader to process them together, without a visual (and thus mental) break. 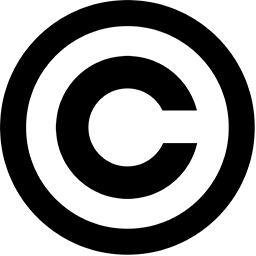 Content is processed together and thus stored and naturally retrieved together. The reader remembers the unifying point. Variation helps to hold a reader’s attention and interest. Both long and short are easier to process when there are not too many in sequence of either one. Too many short paragraphs in sequence gives a choppy effect. Too many long paragraphs in sequence feels heavy. Too much sameness keeps anything from seeming distinctive or significant. “Are the paragraphs surrounding the three studies quite short?” If so, you might choose to combine the three studies into a longer paragraph to break up the choppiness. “Are the surrounding paragraphs quite long?” If so, then you’ll probably want to give your reader a mental break by putting them in shorter paragraphs. As for the case study, a student once included a case study that ran a page and a half, and she put it all in one paragraph. It was a killer! A paragraph shouldn’t go over a page, and very few should go over half to two-thirds of a page. If you find yourself with a lot of chokingly long paragraphs, you may want to try to reprogram your mind to think in shorter units. Question 4: Once I've Chosen What to Put in the Paragraph, How Do I Link Things Up So That They Flow Smoothly? Fitting pieces together in a paragraph is like putting together pieces of a jigsaw puzzle. Pieces are separate units, yet they need to come together to form a complete picture. You need to discern the basic relationship of the pieces and then manipulate them carefully to discover which notch goes in which indentation to make the picture come together smoothly. Develop things completely enough that connections can be understood and processed. With additional information, the pieces become meaningful and the connections become clear. 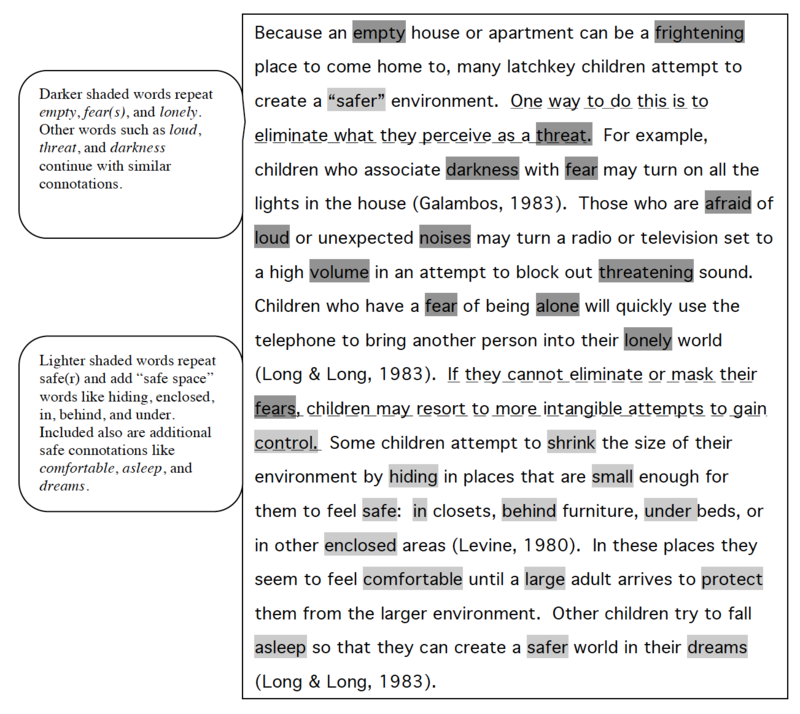 Fill in the gaps and lead the reader smoothly through by using transitional statements: sentences, phrases, and even single words that connect things up. The relationship of the pieces is in the notches and indentations. Transitional words and phrases express these relationships. Here’s the sample revised paragraph again. This time the notches (a.k.a. transitions) are highlighted rather than the extensions. Provide a subtle sense of fit by echoing: (1) repeating key words and phrases, (2) using synonyms, and (3) selecting words that have similar connotations (affective associations). It’s sort of like repeating colors or other thematic elements as a key to understanding the way parts fit into a picture. You don’t have to read the paragraph again, just look at what is highlighted this time. Question 5: Do I Have to Do All of This at Once? Strategies and techniques for improving organization and coherence in your writing are like strategies and techniques involved in most other craft and skill areas; they may seem a little artificial and somewhat overwhelming at first, but they become easier and more natural as you practice them. As principles of visual design, techniques for a musical instrument, or movements applied in athletic skills gradually become part of the way you deal with the materials, the organization and coherence strategies gradually become an unconscious (or at least semiconscious) part of the way you do informational writing. Work out your organization through your outline before starting to draft. Doing this allows you to double check your thinking before you begin putting things into final word choice, and it takes off the strain of struggling with what you are going to say so you can put your full efforts into how you want to say it. Yes, you’ll come to new insights as you draft, and you’ll want to shift a few things around and incorporate new ideas and conclusions. Deeper and more creative application of material is one of the benefits of the language process. But you can handle changes more easily and naturally if you have basic control. Let yourself draft fairly freely. If you’re aware of the need for topic sentences and transition, these things will come fairly naturally as you write, since you have worked out the relationships previously and are able to think in terms of them. Get a friend, spouse, or coworker to read over your draft—or sections of it—to tell you where there are gaps. Your spouse is in a completely different major?—that’s fine, preferable in fact. Someone closely related to your area of study may mentally fill in the gaps for you. An outsider who is grappling with your meaning will notice them. Be sure you choose someone who will be critically honest with you. Don‘t get too tensed up. Lay out your materials, take a deep breath, and get to work.